Manan means ‘involvement with thought. This involvement with thought in the negative form becomes worry, chinta. As a positive thought or in the positive dimension it becomes manan, reflection. How do you know the difference between reflection and worry? In reflection, your mind stays peaceful, whereas in worry your mind becomes agitated. The process is the same as you are becoming involved and absorbed in your own thoughts. However, when you can maintain your objectivity those thoughts are known as reflection. When you cannot maintain your objectivity and you become involved those thoughts are known as worry. You are worried for you are unable to disconnect with what is predominant in the mind. If a thought is predominant you are unable to disconnect from that, if an emotion is predominant you are unable to disconnect from that. When you are unable to disconnect, and you are caught in the swirl of those emotions and thoughts, then that is obsessive-compulsive behaviour. From the perspective of the mantra, it is mananat trayate iti mantraha. Mantra is the procedure, the method which frees the mind from its own obsessive-compulsive thinking. When you do the mantra, you are breaking this thought pattern and focusing your awareness and thoughts on something different. The first thought became the cause of your anxiety and worry. Then you cut that, and you generate a second thought which allows you to experience peace and harmony within you. That is the effect of mantra, for mantra realigns and reorganizes the energy structure of the body and mind. Mantra is a whole subject mantra vijnana, the science of mantra. It is not called mantra vidya, knowledge of mantra. It is not the knowledge of mantra, but the science of mantra. Where the word ‘vijnana’ or the idea of science is used, it indicates a specific procedure that the mantra takes you through, which is sequential. Om Namah Shivaya, the Mahamrityunjaya mantra, the Gayatri mantra. These are common mantras or universal mantras, which anybody can use for a specific purpose. Then there is the guru mantra which is personal and private. It is given to you according to what the guru wants: what level of understanding, what growth, what aim the guru wants you to achieve in life. Therefore, it becomes a personalized sadhana. If the guru gives the mantra So-Ham, you are free to do all the other mantras like Mahamrityunjaya, Gayatri, or various stotras, yet your personal sadhana is indicated by the mantra So-Ham. This mantra So-Ham, when you do it as a meditative practice and not as a chant, internalises you. The spandan or the vibration influences the behaviour of the brain. Your brain is relaxed and tranquilised. Mantras are repetitive sounds used to penetrate the depths of the unconscious mind and realign the vibration of all aspects of your being. Mantras are vibrated through chanting aloud, mental practice, or by listening to them. The experience of how sound vibrations effect your being is Naad yoga. Naad means “the essence of sound” and yoga means “union.” Naad yoga uses sound vibrations to raise your consciousness and tune into the sound that began creation and is constantly vibrating. This universal sound is known as Anahat. In Kundalini yoga as taught by Yogi Bhagan, most mantras are recited in Gurmukhi. The words guru-mukh literally mean “from the mouth of the guru.” Although mantras can be chanted in any language, certain languages are designed to have more of an impact in creating targeted psychological and spiritual effects. The act of your tongue pressing against the palate of the mouth stimulates the hypothalamus, thalamus, and pituitary. When you recite a mantra, you hit the palate with your tongue. In the palate, there are 84 meridian points: 64 in the hard palate and 20 in the soft palate. This vibration emanating from the hypothalamus directs the actions of the pituitary gland and governs the endocrine systems. It is also in charge of releasing chemicals and hormones throughout the body and to the brain. This vibration releases chemical hormones that balance the body and have healing effects. Moreover, the pituitary gland is stimulated through the tongue, hitting the different meridian points. Interestingly, the pituitary gland is formed in the fetus from cells of the roof of the mouth that rise into the brain. This is why pressing the tongue against the roof of the mouth stimulates the gland. Often when we sit down to meditate our mind jumps from thought to thought, making it difficult to focus our attention. Chanting distracts the mind from frivolous thoughts, helping to anchor the mind in concentration. Emotion that is not accepted represents an aspect of the self that is being judged. This emotion causes sensations in the body that you either crave or have an aversion to. Either way, you are reacting and reinforcing the pattern. Chanting is an excellent way to let go of the reaction to the sensation through the throat and heart chakras; in essence, releasing the emotion through self-expression. Furthermore, all your thoughts, feelings, words, and actions impact your consciousness. Think about how certain music puts you into a particular mood. Or consider how you feel when there is a lot of noise or when someone is yelling. Mantras are designed to adjust your experience through the subtle vibrations they cause in your being. Each mantra is designed to have a distinct effect. Everything you seek is within. When you feel that you are not experiencing something, it is because you are not tuned into its vibration. When you are vibrating something, you are tuned into it. For example, if you are vibrating love, you will see it everywhere. If you are not, this vibration lacks. This is also how you are attracted to people and how you can experience that alignment with your karmic vibration. Chanting a mantra tunes you into the experience of the particular mantra. This alignment allows you to experience this vibration by becoming the vibration. The more sensitive you are, the deeper you will experience the effects. Also, the longer and more focused you chant the mantra, the more impact it will have on your consciousness. It is not only mantras that have a strong impact on your being, but every vibration is crucial. When you think negatively, you create a subtle vibration. The longer this vibration persists, the more it effects your being; the vibration of the thought then creates an emotional vibration, which generates a vibration in the physical body. This is where all the sensations come from in the body. When we talk about blocks in the physical or subtle body, such as in the chakras or the nadis where the prana flows, we are referring to areas where the vibration is out of alignment; areas that are vibrating slower than they should and where the flow of vital energy is impeded. The same way that chanting mantras impacts your being, so do your thoughts, words, and actions. This is how habit in your life become patterns. You create vibrations and then, consciously and unconsciously, you react to them. Repeating mantras can help liberate you from these ingrained patterns. See how you may help yourself !! A sound has no religion, it is a collection of vowels encased in a sound structure.It is heard intellectually, but evokes an emotional response, and this response comes from our deeper psyche. A sound, when uttered, enters into our conscious mind, percolates deeper into the subconscious and unconscious layers of our minds at a controlled rate, and hits at that circuit within where it finds a match.Having matched, it stimulates that circuit, a circuit which could have been formed in the past by some “happening”-a situation, an emotion, a circumstance, an event, etc, and this brings out a specific behavioural pattern, an emotional response crude or refined would depend again on the heart culture of the person. The event gets over, impression in the form of circuits remain deep down, waiting for a complete exhaustion of it’s emotive capacity.The cycle continues. The sound, here, can be very effective in not only stimulating and evoking the deep-rooted samskaaraas (impression circuits), but in also understand them intellectually, and harmonizing and healing them to an effect that it breaks it’s cycle of forming a fresh impressional circuit, losing it’s emotive capacity, which is effectively countered by a harmonized intellect given by the sound, and thus freeing the person from a mind which is obsessive in nature.Man feels unburdened, diseases get healed, damaged tissues are rebuilt in the body, electrical activity between the brain and the heart is minimized, breathing rate lowers, heart rate comes down, blood pressure gets regulated. मन,mind; त्र–त्रायती–liberation.That is a sound that liberates the mind from it’s obsessive nature. “If you believe in only One, there will be no fear. So, it is better for you to go on creating a large accumulation of “one sound” in the unconscious, so that there will be only one form. If you create many sounds, there will be many forms there, because every sound has its own form. So you have to know and remember only one mantra, and that will create a great and powerful groove in your psyche. Possibilities of tracing water is more when you dig a fifty feet hole in one place, rather than digging one feet hole in fifty places! When you need help, suddenly that force comes, and manifests for your assistance – and then you think “An angel helped me” or “Suddenly some-one helped me”- but no one besides yourself helped you. It was your own faith and your selected, chosen mantra, percolated deep down in your unconscious layers of your mind, that projected itself out to help you. Since ages, Indians have believed in the power of chanting the sacred word OM, which is generally referred to as Hindu’s religious symbol. For many of us, it may be just a word created out of our rich mythological past. But you will be amazed to know that even science has agreed with the therapeutic, psychological and spiritual benefits that you derive from chanting OM. If you utter the word OM without using your tongue, you will feel a certain amount of vibration in your body. As per the Vedas, all the ordinary audible sounds such as sound we hear from bow and strings, waves against the shore, drum and stick, winds against the leaves, etc only create when they strike each other creating waves of air molecules, which we perceive as sound. On the contrary, the sound of OM is not a result of vibration or striking of two objects. It evolves on its own. It is believed to be the primal sound of the universe that comprises of all the sounds within itself. Our minds have become accustomed to attracting negative things in a way that we imagine negative consequences at first for any given situation. Even the law of attraction mentions that when we think more of negative things, we send negative vibes to the universe which is sent back to us in negative forms. But when you chant OM, you start concentrating on yourself and your soul that drives away the negativity and helps you in interacting with positive elements only. You automatically start distinguishing between negative and positive things. Just try pronouncing OM without shaking your tongue? were you able to tell?? OM is made up of three components A,U.M and it is derived from Vedas.It is representative of the Supreme God Principle (Parabrahman). Chanting of Om has several benefits – therapeutic, psychological and spiritual. Even if you don’t know the meaning of Om or are otherwise skeptic about it, you can still avail the therapeutic benefits from it. The vibration produced by chanting Om in the physical universe corresponds to the original vibration that first arose at the time of creation. The sound of Om is also called Pranava, meaning that it sustains life and runs through Prana or breath. It has been scientifically proved that singing OM has invaluable vibratory effects in our bodies, helps to achieve slow, regular and complete exhalation, aids to control and relax our breathing system and has several soothing effects in our minds. The sustained ‘O’ -formed by the ‘AU’- sound makes all the bones of the thoracic cage vibrate, proving that vibration is communicated to the mass of air contained in our lungs and that the delicate membrane of alveolus in contact with this air vibrates too, this stimulates the pulmonary cells and enables an optimum gaseous exchange in our lungs. Furthermore, the latest research of many physiologists has also shown how this vibration produces very accentuated effects in the endocrine glands, to which Science is gradually attributing an increasing importance. Besides, the vibrant internal massage resulting from the emission of the vowels ‘au’, acts especially in the abdominal organs and the organs of the thoracic cage, whilst the vibration of the ‘mmm’ in our skulls induces a vibration of the cranial nerves. Om is a foolproof method to add healthy years to your life. -The chanting of Om drives away all worldly thoughts and removes distraction and infuses new vigour in the body. -When you feel depressed, chant Om fifty times and you will be filled with new vigour and strength. The chanting of Om is a powerful tonic. -When you chant Om, you feel you are the pure, all pervading light and consciousness. -Those who chant Om will have a powerful, sweet voice. Whenever you take a stroll, you can chant Om. You can also sing Om in a beautiful way. -The rythmic pronunciation of Om makes the mind serene and pointed, and infuses the spiritual qualifications which ensure self-realization. -Those who do meditation of Om daily will get tremendous power. They will have lustre in their eyes and faces. So get on and start Chanting OM to reap the sweetest fruits. -Sit in a quiet place in a comfortable posture. -close your eyes relax your body and nerves. -Start chanting OM and feel its vibration. -continue till you feel comfortable. -When finished just relax and open your eyes. As mentioned earlier, Om is often used/written interchangeably as Aum. Aum represents the three different sounds that are part of the chant. A (“ahhh” or “awe”) begins at the back of the throat as it starts vibrating in the chest and lower abdomen the longer you draw out the sound. It is meant to make us aware of our sense of separateness as a self. U (“oooh”) brings the lips together and moves the sound from the lower abdomen to the heart as the throat vibrates. This sound takes us beyond our sense of self to something greater than what our human senses can tell us. M (“mmm”) involves pressing the lips and front teeth gently together, bringing the vibration to your head, as if it’s buzzing. This sound is meant to connect us to oneness. Silence is the fourth and last “sound” made in an Om chant, even though it’s not really a sound at all. Here, you need to become silent and meditate on the sounds you just generated, as a consequence you tend to go within.Here you may or may not hear the sounds internally, but you would have reached your silent zone. This ends the chant and allows us to become aware of our level of consciousness and to deeply feel what we’re feeling. Now you know why Om chanting is so important and beneficial when your teacher does it with you in class. Consider practicing on your own, using the three different sounds (plus silence) to observe how it makes you feel and reap the benefits of it whenever you want. Hydrogen electrons in DNA conduct electricity. Electrons in DNA create scalar waves. Thus DNA acts as an antenna that sends and receives scalar longitudinal waves. humans possess potent power within itself that one cannot even think of. We have the power of Wellness, power of oneness and power of wholeness. Each ray (Vibration) of light with a specific wavelength defines its color. Each vibration of sound produces certain musical notes in our conscious mind. Similarly, certain kind of vibration represents certain level of consciousness. The way words are arranged in human languages is followed by the genetic code of DNA. Similar to human languages, alkaline of DNA have set rules that follow a grammatical pattern. In fact, similarity of Sanskrit with DNA is because the former is the creation of the latter.All other human languages are the creation of our brain which further gets coded by the DNA. While Russian experiment of using electronic devices to change DNA is not successful, but our ancient sages’ method of changing the DNA Helix through devotional yoga and meditation is guaranteed to be successful. You don’t need any complex instruments to change yourself, since all the needed changes can be mastered through self-control and deep concentration. Technology is good for entertainment but real joy is within the body. All the above experiments prove that our DNA can be changed by sound vibrations. This is how mystics and sages were able to change their body forms by chanting some mantras which are nothing but sound waves that changes the atomic structure DNA. AUM is the most sacred word of the universe and AUM sound creates this universe. Chanting AUM makes your DNA vibrate at the frequency of the universal planets and this is how mystics are able to not only see the outer world but also access the deeper dimensions of existence, communicating with them in their deep meditation mode. Chanting AUM changes your two-stranded DNA to twelve stranded DNA. All mystics and deities have 12 stranded DNA due to which they have absolute control over the universe and can change the materialistic universe as per their will. Effect of sound vibrations on the mind and body is well known today. Calming of mind, lowering blood pressure, removing diabetes, change of DNA are some of the effects that have been found by regular chanting of OM and mantras. Chanting the mantras with names of different gods brings the body of an individual in complete consciousness with the transcendental vibration of the spiritual world. Chanting opens the doors of human mind to perceive higher levels of reality by harmonizing our existence with nature, and realizing the relationship with the Supreme Soul, God. According to Vedas, Our body is hugely affected by sounds waves and light waves. Syntax and semantics of human genes is not only similar to human languages but also react to precisely directed vibration sounds and light patterns. This means that human DNA communicates with the outside world in some coded language which our senses are unable to perceive and understand. Scientists in their latest experiments observed that DNA responds to sound vibrations only of a certain frequency and then perform some task depending upon the information exchanged with sound waves. This confirms that concepts like intuition, light aura, yoga, and telepathy can no longer be considered as a mythical belief as the science has validated the possibility of such existence. Many experiments were conducted worldwide to prove that DNA reacts to sound waves. Conversion of frog embryo to salamander embryo. Out of the many experiments Russian scientists conducted, one experiment involved the projection of DNA genetic patterns of salamander embryo into DNA of frog embryos. Through these genetic patterns, they instructed the frog DNA to convert its embryo into salamander embryo. And then what they observed was absolutely staggering. They saw that the frog converted its embryo into salamander embryo. Without performing any surgical operations or sophisticated procedures, scientists were able to transform embryo of frog into salamander embryo just by beaming some coded genetic patterns. Physicist Fritz-Albert Popp did extensive research on effects of photon on human DNA. From his experiments, he concluded “man is essentially a being of light.” His experiment demonstrated the communication of DNA with photons, matters and even minuscule or bigger life-forms. In one of the experiments, they took two test tubes – one having only water and other containing fragments of donor DNA. Both test tubes were subjected to earth electromagnetic field and enclosed with copper coil to avoid the effect of electromagnetic field. Few hours later, both test tubes were passed through polymerase chain reactions to identify remnants of DNA. What they observed was absolutely shocking. They were surprised to see the copy of DNA fragments in test tube that originally contained only water. They concluded that DNA emits electromagnetic signals that imprint its structure on surrounding molecules like water, sand etc. This means that if DNA can copy itself then copy of the whole body is also possible as it is said in ancient Indian scriptures. This reveals the possibility of teleportation of not only objects but also humans and animals. Another experiment was conducted on people specially trained to express different emotions. Their DNA were relaxed and lengthened on receiving favorable emotions like love, appreciation, pride, compassion etc while it contracted and spiraled further on receiving negative emotions like rage, anger, hatred etc. In an experiment conducted by US military, they took a sample of DNA from a donor and kept it under observation in a separate chamber to study electrical changes. After connecting donor with medicinal equipments that displays electrical reactions, Donor was asked to watch several emotional videos that would create different emotions in donor like crying, laughing, pity, anger etc. Scientists observed that both DNA(kept in sample far away) and DNA in donor body recorded same reactions. DNA reacted identically with the donor in the same way at the same time. This same behavior was observed even when the DNA was taken 50 miles away from the donor. All the above experiments prove that our DNA can be changed by sound vibrations. This is how mystics and sages were able to change their body forms by chanting some mantras which are nothing but sound waves that changes DNA. In the last two articles, we discussed on how AUM is the most sacred word of the universe and AUM sound creates this universe. Chanting AUM makes your DNA vibrate at the frequency of the universal planets and this is how mystics are able to not only see the outer world but also communicate with them in their deep meditation mode. Chanting AUM changes your two stranded DNA to twelve stranded DNA. All mystics and deities have 12 stranded DNA due to which they have absolute control over the universe and can change the materialistic universe as per their will. Chant correctly, else chanting would have no effect. If such transformation of DNA is possible, then the changing of body forms by demons/sages through chanting of some sacred mantras is also possible as it is stated precisely in many ancient Indian texts. Why the demon Maricha of the World’s oldest epic ‘Ramayana’ could transform itself into a golden deer? Why hanuman could change, increase or decrease his body-forms by chanting some mantras or by chanting ‘Jai shree Ram’? In Vedas, it is said that supreme Brahman (God) can modify life forms on earth just by reorganizing sound waves or retransmitting modified sound waves in the environment. Though very difficult to verify, latest scientific experiment do hint of such possibility. Since Vedas says that universal Creation by sound waves involves transcendental reality that cannot be understood by our illusionary mundane senses but by spiritual perfection and enlightenment, it is almost impossible to verify the creation of this universe by vibrating sound waves. It should not be surprising that the universal laws of creation is kept inaccessible from normal humans and is revealed to only those who strived hard for spiritual perfection. Through different satellites and devices, Scientists have been directing different sound vibrations in the universe to communicate with outer living beings. They have failed because they haven’t tried transmitting AUM sound waves at different frequencies. I guess since AUM is the sound of the universe, projecting AUM sound waves can help in communicating with aliens of the outer world. *Why scientists should focus equally on wisdom as they would on scientific knowledge? Many modern scientists boast high of their achievement and scientific knowledge but they fail to acknowledge that wisdom is more important than knowledge. Knowledge is good but wisdom is the highest quality of all. It’s easy to gain knowledge by researching on several topics but the wisdom can be gained only by experience. One may have abundance of knowledge in spirituality, programming languages and latest technologies but one hasn’t made full use of his wisdom to gain from the ocean of knowledge. I would like to say “exploring and understanding the universal creation and situation surrounding you should be the goal of your life”. The more you envision this materialistic world, more are the chances of transforming yourself according to your evolutionary needs. When you chant Om, you feel expanded as if you are becoming large in dimension, as the waves in the ocean become large. Om is a vibration and not merely a sound made by the mouth. The whole world is made of subtle vibration. We have to think very carefully here. We generally think that things produce vibrations. This is not so. It is the vibrations that have made things. This is a very difficult thought for us because we believe that we are solid bodies, and that there are solid bodies in the world from where vibration comes. This is not so. The vibration was first, and it became condensed into hard bodies like our body and other things. We know that all things in the world are subtle electric force at their root. Every object is an electromagnetic field. The substantiality or the hardness of the object is a delusion. The hardness, concreteness, and substantiality of the thing is due to the repulsion and attraction of forces. I am telling you something which is also the conclusion of modern science. Our whole body is a mass of electric energy, and everything in the world is also a mass of energy, but atomic constituents in particular locations differ from one another. One atom differs from another atom to the isotopic difference in each one. Similarly, we have the difference of different things, different objects. There are different objects because of the different intensities of electric force at different spots. If the inner constituents of atoms are the same everywhere, there will not be many atoms. There will be one atom only. Every atom consists of certain electrons and a central nucleus. The number of the electrons varies in different atoms. It may be one or two, or more. Not only does the number vary, but the velocity or speed also varies, so the number of the electrons and the speed of their movement distinguishes one atom from another. This particular individuality maintained by each atom is called the isotopic weight. Certain uniformly cooperating atoms join together and form a society. I mentioned that every atom is different from every other atom, and now I will explain how they can form a society even if they are different. We are all sitting here. One person is different from another person. We have got atomic individuality, as it were. No person is like another person, but we all form a single group: an Italian group, French group, yoga group, and so on. We have got a society of people, though each person is different. Now, what is society? It is the coming together of certain common characteristics, though basically they are different. So certain types of atoms can form a group in a society. Our body is made up of such groups of electric energy, and similarly, everything in the world is made of energy. When one particular location of an electric centre comes in contact with another, there is electric repulsion. That repulsion is the reason why we feel that there is a solid object. Therefore, the solidity of an object is a sensation in the mind, not a real existence outside. This world is not made up of persons and things, which is why some great yoga scriptures say there is no world. The world does not exist as we see it, because the world is actually a mass of electric force. So when we chant Om we are not making a sound from our body, but generating an energy which is the real substance of our personality. *The chanting of Om is itself a yoga practice*. It is the way by which we are entering into our own basic roots. It is as if the atom is trying to realise what it is inside. Sound and light are vibrations, and vibrations cause perception and hearing. A certain frequency of vibrations comes in contact with certain vibrations in the eye and produces the phenomena of light and colour. Similarly, certain lesser frequency vibrations come in contact with the ear and produce sound. Actually, there is no light, and there is no sound. There is only one force. We have five kinds of receiving sets of energy. I will give an example of how the receiving sets can receive one thing in different ways. There is electric energy coming from the powerhouse. When we connect this power to an electric heater, there is a blaze of fire. In a stove, electricity becomes hot. In a fridge, electricity becomes cold. In a railway train, electricity becomes movement. But electricity is not heat, it is not cold, it is not movement. So is energy neither colour nor sound nor touch nor taste nor smell. It looks like these because of our receiving sets: eye, ear, nose, tongue, etc. So when we chant Om, we are diving deep into the very substance of the whole universe. It is as if we are melting the hard body and making it into a liquid of force. Om is not Sanskrit or English or Italian or any language. *It is not a language, it is an impersonal universal vibration*. All language is inside Om, as well as all literature and all science. Just as every piece of furniture is in the tree, and every ornament is in the gold bar, likewise, every language, every sound is in Om, so when we chant Om we are going to the universal origin of things. Therefore, we have to chant Om very feelingfully. Aum is a complete Asthanga Yoga in itself. Asthanga Yoga is the basis of all yoga and was introduced by Yoga Sutras of Patanjali based on the Vedic teachings. Its eight limbs are Yama, Niyama, Asana, Pranayama, Pratyahara, Dharna, Dhayana and Samadhi. Chanting of AUM with “UM” part chanted through the nose during expiration and slowly, with eyes closed, in a relaxing posture with mind preferentially concentrating on the sound fulfills all the criteria of Asthanga Yoga and should be advocated as a stand-alone Yoga exercise. For doing Yoga one needs to follow the dos and don’ts of yogic life (Yama and Niyama). These incorporate the principles of moderation and variety and satvik balance in life. A person is also asked to avoid smoking. Yogic Asanas are based on the body-mind awareness and stretching of any of the seven chakras, the crown area, the third eye area, the throat (thyroid) area, the heart area, the celiac umbilical area, the gonad area and the sacral area. These seven chakras in allopathic parlance are represented by one endocrine gland each and have autonomic plexuses located in that area. We bestow aashirwad on the Crown chakra; smack our forehead on the Third Eye chakra when we do something wrong, swear by the Throat chakra and love from the Heart chakra. Celiac chakra controls doubt, Gonadal chakra attachments and the Sacral chakra the emotions of fear. When we chant aum it is a combination of “AU” a vowel sound and “UM” the nasal vibratory consonant sound. The chanting of vowels has been shown to produce interleukin-2, a pain killer and chanting of the sounds based on the last words of each line of Sanskrit varnamala (M, N, Ong, Un, Unn etc) produces delta activities in the brain suggesting tranquility of the mind. Whenever we have pain we automatically produce a vowel sound and each time we are disturbed, we weep and end by producing a nasal UM sound. These sounds are also vibratory in nature and vibrate all the chakras simultaneously with maximum effect on the chakra where the awareness is. When we cry, the respiratory rate increases and when we relax, the same decreases. The reverse is also true. To relax therefore one needs to reduce the rate of respiration willfully. This can be done by prolonging either the inspiration or the expiration. Normally the respiratory rate is 15 per minute, or one respiration in four seconds (two seconds each for inspiration and expiration). The respiratory rate can be slowed by either prolonging the inspiratory or expiratory period or by adding gap in between inspiration and expiration. This process of slower and deeper respiration is called Pranayama. If we chant the UM part of AUM during expiration and prolong it till the expiration is over, it has the same effect as Pranayama and is called the AUM Pranayama. It has the added advantage of being a vibratory sound, of stimulating the endocrine glands and the parasympathetic nervous plexuses with the result of reducing the heart rate and the respiratory rate. While chanting AUM when the eyes are closed, the inward journey starts, called Pratayahara. Chanting starts with the intention of chanting (dharana). It is then made repetitive (dhayana) and continued for a few minutes, and ends with one’s absorption in the sound and then into “nothing” or shunya called samadhi. Chanting of AUM therefore is complete Asthanga Yoga by itself with Yama and Niyama representing the do’s and don’t of lifestyle, posture with stretch over the chakra as the asana, nasal expiratory prolonged chanting of “UM” as the Pranayama, closing of the eyes as the Pratayahara, and being aware (living in the present moment awareness) till one is lost in the repetitive chanting as Dharana, Dhayana and Samadhi. The chanting of AUM vibrates the endocrine glands, has pain-relieving action, increases tranquility of the mind, balances the endocrine glands, shifts the awareness from sympathetic to the parasympathetic mode, reduces heart rate and respiratory rate and shifts one to an internal healing mode. Twenty minutes of AUM chanting, morning and evening, has the same effect as that of seven hours of deep sleep. All letters of the alphabet are hidden in the word ‘Om’ (AUM). The sound A is produced from the deeper part of the throat; the word U from the middle part of the mouth, and the word M from the lips, labials and the teeth, the front part of the mouth. The word ‘AUM’, therefore, represents the production of complete speech. The Mandukya Upanishad describes ‘Om’, and other Upanishads also dwell upon it. According to Kathopanishad, ‘Om’ is a great word, which all the Vedas talk about. All of us have learnt about vowels and consonants. The consonant is a sound which cannot be spoken without the aid of a vowel. The letters ‘A’ and ‘U’ in Sanskrit are the parents of all other vowels. The alphabet ‘M’ is a consonant, which when spoken produces powerful vibrations as it involves the movement of the lip, the mandible and the teeth. During inhalation and exhalation (process of respiration), one produces the sound ‘so’ (inhaling) and ‘ham’ (exhaling), the word ‘soham’, therefore, is repeated with every breath. From the word, ‘soham’, if the consonants (s and h) are deleted, the word ‘oam’ remains, which is also the form of ‘Om’. In Sanskrit, ‘A’ is the first letter of alphabet and ‘M’ the last. Thus, ‘A’ and ‘M’ represent everything from ‘a to z’ i.e., from beginning to the end. If one listens to the sounds of nature like the sound produced by the flowing Ganges, the sound from the Himalayas, the sounds heard in the bustle of the city and its markets, sound produced when the fly wheel of an engine is set in motion, or of landslides, rain, and fire or thunder, you will find that these are nothing but manifestations of ‘Om’ in nature. The creating force ‘Om’ is the symbol of that creating source which many religions call as ‘God’. It is a monosyllable of sacred value and is the essence of the tradition of the Vedas. It can be considered like a boat, which can carry you to a journey towards internal happiness. Whenever one suffers a physical pain, the body produces a vowel sound – ‘ah’, ‘ee’, ‘oui’, ‘ma’, ‘ii’, ‘oo’ etc. The chanting of vowels produces physical health. When one is disturbed, he or she becomes relaxed after crying. Weeping sounds are ‘um, un, ong, unn’ spoken from the nose during expiration. Each one is the last sound of each line of the Sanskrit alphabet. Chanting of weeping sounds has been known to produce delta activity in the brain EEG waves, which is consistent with the tranquility of mind. Weeping sound, therefore, produces mental relaxation. If one chants both a ‘vowel’ and an ‘M’ in the weeping sound, one will achieve physical as well as mental relaxation and this is what spiritual relaxation is. All healing sounds have a ‘vowel’ and the weeping sound ‘M’ in common. ‘Ahmeen’, ‘ameeen’, ‘hoong’, ‘im’, ‘um’, aoung etc. are all mantra sounds in different religions and have the same spiritual significance as the sound of ‘AUM’. The word ‘Om’ by its mere vibrations can destroy disease-causing germs. The only thing required is to sit quietly at a place detached from the outside world and chant ‘Om’ for just three to five minutes, two to three times in a day. This practice can help drive away all the worldly thoughts from the mind and help in achieving a state of mental relaxation. This practice, therefore, can be a good relaxation technique in today’s stressful lifestyle. Mantra chanting is an age old spiritual practice that is a route to self – transformation. By chanting mantra, we are actually producing certain sound waves in a fine tuned frequency into the universe which will then reflect back to us. Mantra chanting helps in promoting constructive thoughts, feelings, actions and manifestations. I personally feel vocalising a mantra, chanting it, engages more sensory organs thereby creating structural and functional changes in the brain. Mantra is that force which releases the mind from it’s obsessive nature. A Mantra can be made up of syllables, a word or a sentence that exert their influence by the means of sound vibrations. Mantra generates physical vibrations that infiltrate each and every cell of the human body beyond the cognition of the mind. It is a well-known fact that whenever we suffer physical pain, we automatically produce a vowel sound. For example, the spontaneous reaction when one is pricked by a pin or needle is to say out loud ‘ee’ and when in pain, the sound ‘Ah’ is produced. Research has demonstrated that chanting of vowels produces interleukin-2 in the body, which has an action, similar to that of aspirin, a painkiller. Therefore, chanting of vowels produces analgesics or painkillers in the body is a scientific fact. 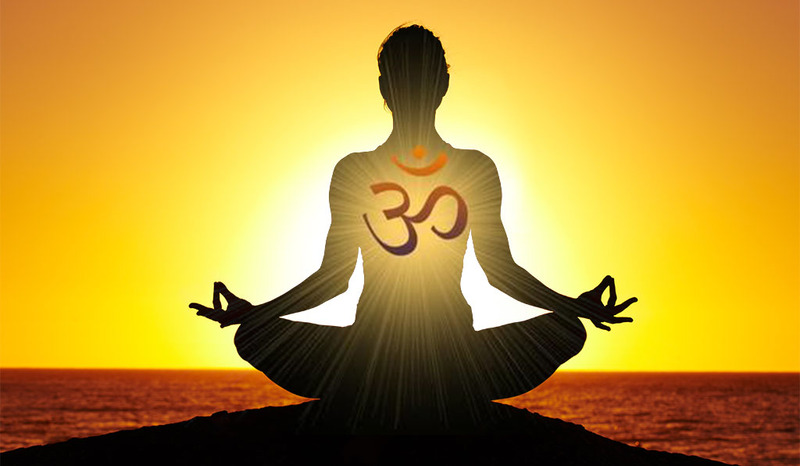 If we look at the specific sonic components of OM mantra that is interpreted as “AUM”, where by chanting “aaa”, one can feel sensation in the brain, abdomen and thoracic region as it stimulates perception and concentration. Chanting “ooo” generates sensation in throat and chest region and it stimulates emotions, feelings and dreams. Chanting “mm” creates vibrations in the nasal cavity and the brain, while it stimulates extreme focus and ecstasy. When combined, we get the AUM mantra that channelizes energy in the body and activates vagus nerve, phrenic nerve, stomach, spinal cord, throat, nasal cavity and skull areas. The sound AUM is followed by a brief silence to produce a quieted state, this state of calmness and quiet promotes wellness in the body mind and spirit. Mantra chanting has number of physiological benefits on our body, including reducing heart rate, slowing respiratory rate, and reducing skin resistance. By examining effect of mantra chanting on brain, several structural and functional benefits have been seen. Tomasino et al. and Kalyani et al. by using magnetic resonance imaging (MRI) during mantra chanting found that mantra chanting activates inferior frontal gyrus, prefrontal cortex, limbic and superior parietal areas, middle cortex, and precentral cortex. (a) The activation of these areas increases connectivity between white matter and gray matter of the brain. This connectivity is related to higher intellection and improvement in stroke patients. (b) By reciting mantras, certain brain areas gets activated that result in an alert state, while other areas are deactivated that induces calmness and peace. (c) Mantra chanting can also activate the brain areas that help with language skills during memory loss. (e) MRI brain studies have indicated that mantra chanting stimulates vagus nerve; hence it has been used to treat depression and epilepsy by many clinicians around the globe. A study done by Dr Alan Watkins (senior lecturer in neuroscience at Imperial College London) proved that during chanting our heart rate and blood pressure dips to its lowest level. Chanting also normalizes adrenalin levels, brain wave patterns and lowers blood cholesterol levels. By reducing resting heart rate, mantra chanting can improve blood pressure and cardiac output. A study conducted by Telles, Nagarathna and Nagendra, 1995, showed that practicing “OM” mantra – thought in the brain rather than vocalized showed significant reduction in the heart rate during chanting as compared to the controls. This study proves a strong correlation between the psychological and physiological relaxation. Studies have shown that reciting mantras can slow respiratory rate to six breaths per minute. This correlates with the rhythm of circulatory system. This synchronized rhythm is important for maintaining healthy blood pressure and heart rate. Slower respiratory rate also increases sinus arrhythmia, blood oxygenation and tolerance to exercises. An 8-week study done on people suffering from mild-to-severe depression at the Samarya Center for Integrated Movement Therapy and Ashtanga Yoga in Seattle, WA, found that chanting control expiratory output level and increases breath control. That in turn helped participants in reducing anxiety and improving mood. Researchers concluded that if done consistently, chanting proves to be an effective means of uplifting people’s mood for an extended period of time. In a study, mantra chanting was used as a method for treating alcoholism, wherein mantras were practiced at sunrise and sunset for six weeks. Researchers found that mantra chanting by suppressing delta and alpha brain waves produces mental tranquility and helped subjects to curb urge for alcohol. Mantra chanting is supported by many health and wellness practitioners. Chanting is believed to drive away all distractions, unwanted internal chatter and bring state of relaxation. It is a devise for personal growth, positive attitude, heightened senses, sharper mind and brings a new vigor to the body. Reciting mantras also help to purify speech and helps in maintaining a constant spiritual connection and in turn affect temper, vocal pragmatics and complete wellness of the body. Wellness truly is dependent on how well you can manage stress on the daily basis. In a study detecting the effect of mantra recitation on stress management, researchers found that daily chanting of mantras were associated with immense benefits including stress relief, feeling of well being, sharpened intellect, emotional steadiness and positive thinking. The effect of mantra chanting on intellect has also been noted in a study that evaluated digit-letter substation task (DLST) during chanting. The results of the study showed significant improvement in attention potential as indicated by improvement in DLST scores. Mantra chanting can lead to improved mental as well as physical functioning. One study showed that a brief daily chanting by caregivers of dementia patients resulted in better mental function and improved immune cell response. The study also found that mantra chanting can increase telomerase activity, that suggests reduction of premature cellular aging. As per the researches done at the Cleveland University, USA, the rhythmic tones produced in our body during chanting create an effect called the Neuro-linguistic effect [NLE]. And when we know the meaning of the mantra we are practicing, an effect called psycholinguistic effect is produced in our body. Both of these effects are due to production and transmission of certain chemicals in our brain. This is the real reason why chanting mantra produces healing effects in our body. The vibrations produced during chanting clams the nervous system and helps in bonding with people around us especially when practiced in a group. This 5000-year-old practice of mantra chanting to provide a means of reducing mental and physical stress through a simple focused activity that slows respiration, improves concentration, and induces calmness. OM is most sacred sound of Hinduism and also referred as Omkaram. In Sanskrit it is described as Pranava-Nadha means primary or root for all sounds. It should be pronounced as A-U-M. Every mantra in Hinduism OM is added at the beginning and ending phrases to acquire power to that mantra. Hindus believe that the letters (A-U-M) in OM represents ‘Trimurthi’ (Lord Shiva,Lord Vishnu and Lord Brahma) . The sound removes all sorts of worries,sins and brings inner peace to chanter. OM is Un-Manifested form of Lord.Om is considered as origin,center and end of everything. Om is the only sound that makes a person to reach peak of spiritual life and shows supreme reality. The planets which revolve around the sun make a noise which is called as OM. Chanting sacred OM synchronizes the body with the vibration of the universe.OM is considered as NAME and FORM of absolute. Chanting OM purifies the mind,soul and creates inner peace. Ancient texts state that OM is ‘Anahata Nada’ (The sound that is not produced by striking two objects). According to the Maitri Upanishad OM represents the primeval vibration of Universe, OM is the Center of the Universe. OM is the seed of infinite knowledge. Om is considered as mother of all mantras and treated as sound of all sounds. OM represents three levels of consciousness(waking, dreaming, deep sleep). OM represents the past, the present, and the future in the Mandukya Upanishad. OM is the mantra used in meditation to focus the mind. OM is a combination of a vowel(A-U) along with a nasal consonant(Mmmm..). OM makes respiratory rate equal to the rate in balanced and relaxed state. Chanting OM(A-U-M) produces nitric acid and brings more oxygen to the body. Electro-Magnetic waves are generated in the body. chanting OM gives creativity and happiness. Sound waves of OM transforms water into ‘Sri Yantra’ Which was explained scientifically using Cymantics phenomena. Chanting OM regenerates and gives new life to body cells and acts as an anti aging agent. The vibration effects prominent change on the endocrine glands. The sound gives power to heart,lungs,free blood circulation, digestion and acts as a detoxifying agent. Chanting OM makes breath slow and steady in a controlled manner and relieves stress. Allopathic research has stated that chanting of vowels and nasal constants (A-U-M) produces interleukin-2 in the body, which has power to suppress pain and reduces tension, anxiety and fear. Everything is composed of waveforms of energy – effectively sound waves – and the impact of sound on matter is well known. From certain music affecting our moods, to NASA experimenting with acoustical levitation (so far they have only lifted a tiny ball in a vacuum! ), the impact and value of sound is abundantly clear. From the sound of the earth and sky, of tides and storms, the echo of a train in the distance, the pounding reverberations of a carpenter at work; from the first cry of life to the last sigh of death, from the beating of our hearts to the soaring of our imaginations, we are enveloped by sound and vibration every moment of every day. It is the primal breath of creation itself, the stuff of which life and dreams, souls and stars, are ultimately made from. It has even been proven by quantum physics that ATOMS emit their own sound! Cymatics is the study of visible sound vibration. Typically the surface of a plate, diaphragm, or membrane is vibrated, and regions of maximum and minimum displacement are made visible in a thin coating of particles, paste, or liquid. Different patterns emerge in the excitatory medium depending on the geometry of the plate and the driving frequency. Cymatics effectively shows us how sound affects matter. 1. Music can slow down and equalise brain waves. It has been demonstrated repeatedly: brain waves can be modified by both music and self-generated sounds. 2. Music affects the heartbeat, pulse rate and blood pressure. The human heartbeat is particularly attuned to sound and music. The heart rate responds to musical variables such as frequency, tempo, and volume and tends to speed up or slow down to match the rhythm of a sound. 3. Music can regulate stress-related hormones. Anaesthesiologists report that the level of stress hormones in the blood declines significantly in those listening to relaxing, ambient music – in some cases replacing the need for medication. Those hormones include adrenocorticotrophic (ACTH), prolactic, and human growth (HGH) hormone. 4. Music and sound can boost the immune function. Scientists in a study at Michigan State University reported that listening to music for only fifteen minutes could increase levels of interleukin-1 (IL-1) in the blood from 12.5 to 14 percent. Interleukins are a family of proteins associated with blood and platelet production, lymphocyte stimulation, and cellular protection against AIDS, cancer, and other diseases. 5. Music can boost productivity. The University of Wisconsin reported that in a study of ninety people copyediting a manuscript, accuracy in the group listening to light classical music for ninety minutes increased by 21.3 percent. 6. Music can strengthen memory and learning. Playing an instrument or participating in a music program in school (or incorporating music into classroom activities in such areas as history and science) has been shown to have broadly positive effects on learning, motivation, and behaviour. A MANTRA is a sacred utterance, sound, word, or group of words believed by some to have psychological and spiritual power. A mantra may or may not have syntactic structure or literal meaning; the spiritual value of a mantra comes when it is audible, visible, or present in thought. The earliest mantras were composed in Vedic times by Hindus in India, and those are at least 3000 years old. Mantras are now found in various schools of Hinduism, Buddhism, Jainism and Sikhism. Similar hymns, chants, compositions and concepts are found in Taoism and Christianity, amongst others. It is thought that the utterance of different words has its impact on different glands and by such impact the energy of these glands gets stimulated. This is the basis of mantras and this is why mantras have been composed. There are 100’s of mantras. And, my personal favorite, is one called the GAYATRI mantra. The GAYATRI mantra, which was written in Sanskrit about 2500 to 3500 years ago, has been the mantra many have chanted for many centuries, even before that. For thousands of years, this beautiful prayer has seemed mysterious to the Western mind and was out of reach even for most Hindus. It was a well guarded secret, withheld from women and from those outside the Hindu Brahmin community. The fact that it is an earnest and heartfelt appeal to the Supreme Being for enlightenment, it can be Universally applied. It is well known that everything energetically is LIGHT and SOUND and therefore by intention we can enable positive changes within our body and mind. The mantra does more, as I have found, it opens up your heart, and when both our minds and our hearts open, we open ourselves up for new possibilities. For me, miraculous events have occurred whenever I have recited the Gayatri Mantra. According to the Vedas, there are seven realms or spheres or planes of existence, each more spiritually advanced than the previous one. It is written that through spiritual awareness and development, we can progressively move through these realms and ultimately merge with the Supreme Being or Source. Many Buddhist teachings have also referred to these seven realms. By chanting this mantra, Divine spiritual light and power is said to infuse into each of our seven chakras and connects them to these seven great spiritual realms of existence. There are twenty-four letters in Gayatri Mantra which are said to be related to twenty-four such glands located in the body which, on getting stimulated, activate and awaken the powers of righteous wisdom. By uttering Gayatri Mantra, the chord of the subtle body of the reciter is said to start playing, tinkling at twenty-four points, creating sound waves which impact important elements of the invisible world! As you have seen earlier, sound has a huge impact on dense matter! Could there be some truth behind this theory? The flow of sound of these 24 letters of the mantra is considered to be of deep significance. As we have seen, cymatics shows the hidden impact of sound, and the results which can be achieved by its subtle vibrations. The various syllables of the Gayatri mantra and their considered effects on different parts of the body. I received a thoughtful question from a reader: “Why would my brain want to love saying Om?” We have often heard (or heard of) yoga students or ourselves chanting the sound Om or Aum at the beginning or end of a yoga class. When I first took a yoga class, I was curious as to the reason and significance of using this sound, feeling slightly awkward uttering aloud this unfamiliar sound. Indeed, in some of my yoga classes, there may be students who opt out of participating in this part, instead choosing to remain silent. As a seeker by temperament, so to speak, and thus a true skeptic in the sense that I enjoy questioning unfamiliarities to a healthy degree – rather than the self-serving doubting of everything that doesn’t agree with the limited convictions of the personal mind – I figured that chanting such a sound may have a functional purpose if I experimented with it. I soon discovered that there is a vast science of sound in yoga used for increasing awareness and expanding emotional states of the human personality in ways that align with some recent investigations in neuroscience. In the course of human evolutionary history, the auditory faculty evolved to process some set of constant features in nature, which make up the core grammar of auditory perception. These are the bite-sized pieces of sound information that the brain has evolved to process and of which to make sense. Through our sense of hearing the brain detects forms in space, much like echolocation in bats, by recognizing the sounds of interactions among solid-object physical events. Imagine that you hear the sound of a car’s tires screeching, followed by a crash, and then the reverberation of the impact. What you’ve just heard is a series of events: a slide (tires screeching), a hit (the impact) and a ring (the reverberation), the three major types of physical interactions. Neuroscientist Mark Changizi has posited that the major phonemes of speech have evolved to resemble these kinds of interactive events, in a sort of onomatopoeia, where the sounds of the words resemble the events themselves, such as in “screech” and “crash.” Speech, and even music as an ordered narrative of sounds, make use of our brain’s evolved capacity to perceive natural sounds. Mantra is a Sanskrit word for “sound tool,” and Om is one of myriad such mantras. Sanskrit and some other ancient languages such as Tibetan, prototypical Egyptian and ancient Hebrew evolved as complex systems of onomatopoeia, where the sounds evoke movements of energy. This evocation is qualitative and subjective and is linked with interoception (inner body sensations) and emotional sense of self, both predominantly represented in the right hemisphere of the brain. Conversely, the narrative strand of sounds in which we give them meaning is done predominantly through the left hemisphere. What is fascinating about mantras is that from a physics standpoint, the sounds themselves, before they are assigned meaning, will resonate in different parts of the body and mind, creating actual interactions or events. Mantras are information, in the literal sense of in-forming: the creation of form, or interactions. The Sanskrit language is an information sequencing system that mimics the process of nature’s repeating patterns. As the Sanksrit scholar Dr. Douglas Brooks has said, “Sanskrit tells us what Nature shows us. A limited number of rules gives an arbitrarily large number of outcomes. The way Nature goes about its business, Sanskrit goes about its language.” Much like the emotive quality of immersing oneself in music, mantra uses sound to evoke movement of physical and emotional energy through stimulation of the nervous system, from which emerges meaning and narrative. In order to have insight into and validate a mantra for ourselves, it must be experienced and felt through introspection. Let’s take the mantra Om, or Aum, one of the most common in Sanskrit and Tibetan. If Aum is indeed onomatopoeic, then performing it can create an event inside the nervous system, which can then become an object of concentration and meditation, and thereby a focal point for expanding physical and emotional awareness. In terms of phonemes, we notice that it does not have any plosives or fricatives, only sonorants. From the types of solid-object physical events that the brain evolved to perceive, this respectively corresponds to an absence of hits and slides, and the presence of only rings. A, U and M are sonorants or rings, so this particular mantra qualifies an object that inherently has no interactions (hits or slides). In terms of physics, this means our object is formless. Try resonating the mantra aloud, allowing air to flow through the nasal passage, smoothly transitioning between the three sounds. If you do not wish to disturb anyone that may be around you, you can whisper the sounds subvocally. The A (pronounced ä, as in “car”) can feel like a wide opening and has a broader vibratory effect on the physical body, approximating the gross consciousness of the waking state. The U (pronounced o͞o, as in “soup”), has a funneling effect, narrowing the consciousness into subtler sensations such as thoughts and impressions, approximating the dream state. The more nasal M sound is like the drone of a bee; it makes the cranium vibrate in a kind of undifferentiated and ubiquitous earthquake over the convolutions or valleys in the cerebral cortex, approximating the deep dreamless sleep state of consciousness. Traditionally, Aum represents and has the capacity to progressively open up the practitioner to the ever-present formless and timeless reality, the background radiation of the cosmos that echoes the Big Bang. Aum is found in the form of Amen in Christianity, Judaism and ancient Egyptian, where it also codes for the immutable eternal aspect of consciousness. The feelings and symbolic representations of the sounds will differ from person to person because, like any tool, the effects of the sounds depend on the user operating them and the object of use, namely the condition of the body and mind. The practitioner should first develop a state of relaxation through proper breathing. It is also important to take interest in or to have a healthy curiosity for the practice so that the effect of actually enjoying the learning process may help the mantra get a foothold in the system. Mantras can be done vocally, sub-vocally (whispering) or silently in the mind. It is recommended to start aloud, and then proceed with the more silent variations. Silent repetition does have an effect; when the frequency of any sound is high enough, it extends beyond the human range of hearing and eventually achieves stillness, which is beyond sound itself. It has been demonstrated in a double-blind study that ultrasound probes applied to the skull can improve subjective mood, and it has been evidenced that even imagining performing musical exercises rewires and strengthens nerve connections. Both of these studies speak to the capacity of mental recitation of mantra to activate and affect the physical nervous system. Moreover, group chanting or recitation of mantra can synchronize the brainwaves between the participants, achieving yet another level of collective effect, as has been shown between musicians, which can help to understand the functional basis for group chanting in many of the world’s wisdom traditions. The Sanskrit language is code for the patterns of nature, sonic representations of the way nature works. Mantras hold within them the latent forms of the universe. From supreme stillness and subtle ultrasonic vibrations, these latent forms cascade into being as audible sound, which then has the capacity to in-form, or shape reality, as has been demonstrated by cymatics. By practicing mantra, we can tap into the source of that power to manifest – we can drive our awareness deeper into the bones, muscles and tissues of the body to gain a greater sensitivity and understanding of our makeup and amplify the emotional energies latent within, much like the potential energy present in mountains that then becomes kinetic in the form of an avalanche when the earth quakes. By aiming with intention the practice of mantra into progressively deeper layers of ourself, we can bring more of ourself online, as it were, and therefore more on board the journey of health and fitness towards union and wholeness. Through mantra, we have the opportunity to practice yoga.